After setting the scene with a brief description of the landscape, this attractive and colourful booklet goes on to describes the archaeology of what is one of Peeblesshire’s most beautiful valleys. The writers tell the story of its past inhabitants, from the traces left by early prehistoric hunters as they camped by the Tweed to the ruinous towers of its 16th century lairds. 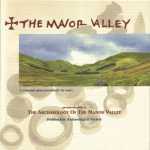 "... a winsome grace peculiarly its own": an Introduction to the Archaeology of the Manor Valley. - from text compiled by Ken Cobban, Trevor Cowie, Peggie Ferguson, Bob Knox, Isabelle Paterson and Tam Ward. The proceeds form the sale of this booklet are used to fund our current fieldwork projects. The Society reqularly publishes newsletters updating members on its activities. Copies can be downloaded as pdf files by clicking on the links below.